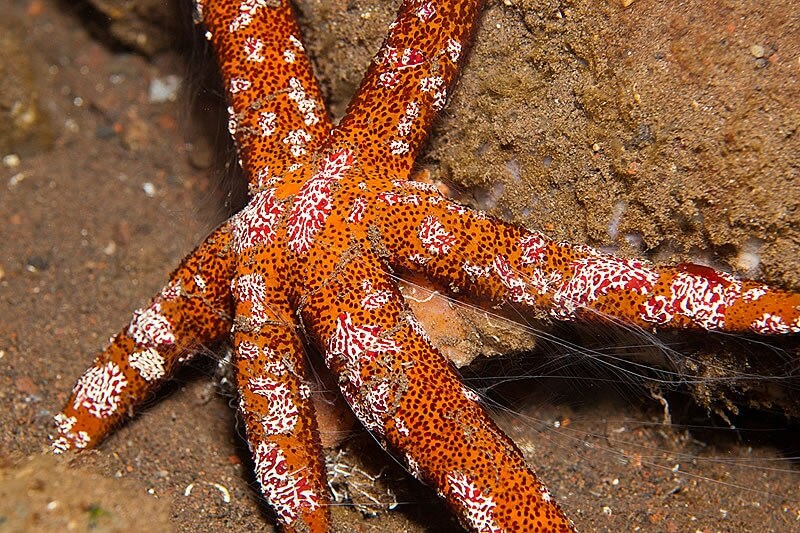 Brightly colored sea stars are a regular occurrence on our survey dives. We only tend to notice them when we see a new and highly decorated species or dive a site where they are highly abundant. One survey dive we did a few days ago had a noticeably higher density of Blue Sea Stars (Linckia laevigata) which we saw peeking out from under corals or sitting right out in the open every couple of meters. 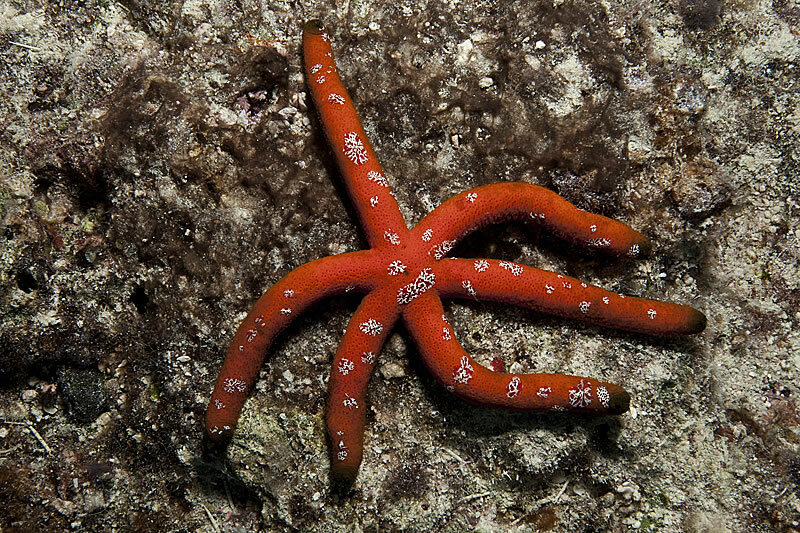 While spotting and photographing sea stars is initially irresistible at the start of a mission, their ubiquity on the reef means that most divers soon lose interest in them as they fade into the background. 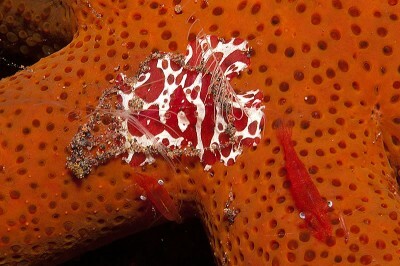 Interest shifts to other strange and colorful creatures on the reef. Recently, my interest in sea stars was rekindled though not because of the sea star itself but because of what was living in association with it. While it might have looked like the sea star was covered with brightly colored flatworms it was in fact host to something much more interesting—benthic ctenophores, also known as sedentary comb jellies. Normally ctenophores are found floating through open water where they extend two sticky feeding tentacles to catch passing plankton on which they feed. The planktonic ctenophores are often confused with jellyfish but they lack the stinging cells that are characteristic of jellies. These ctenophores in the order Platyctenida are flattened ovals that use their pharynx to cling to the substrate. They may be found on rocks, algae, or various invertebrates, primarily cnidarians (anemones and corals) and echinoderms (mostly sea stars). Though they may at first glance look like flatworms, the two long tentacles with smaller branched side tentacles (tentilla) containing adhesive cells mark these as members of the phylum Ctenophora. What at first looks like flatworms covering a sea star are revealed through their two branched tentacles to be benthic ctenophores. 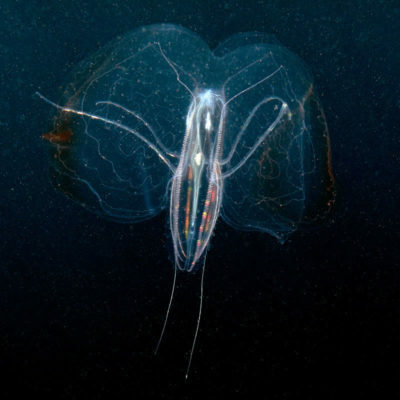 Because these benthic ctenophores are so unlike the ones divers are more familiar with they are always fun to show to divers who are unaware of their existence. The momentary look of confusion and disbelief on their faces as they try to fit this outlier into their concept of ctenophores is priceless. 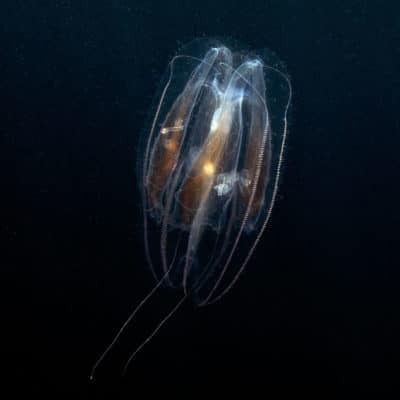 Ctenophores are usually found floating through the water column with other jelly plankton.